Upper subalpine forests generally occur above 7,000 feet and extend to the upper timberline. Average July temperature ranges from 50 to 60o F, and mean annual precipitation ranges from 25 to 60 inches within this zone. Trees of upper subaline forests must withstand extreme cold in winter months and severe frosts in summer and prosper despite short growing seasons..These conditions generally preclude establishment of ponderosa pine, Douglas-fir, western larch, and western white pine. Only the most cold-tolerant tree species, like subalpine fir, Englemann spruce, alpine larch, lodgepole pine, and whitebark pine, can persist within the region's upper subalpine zone (Pfister et al. 1977, Cooper et al. 1991). High-elevation sites exposed to intense wind or sun, including dry ridges and south-facing slopes, typically support whitebark pine. 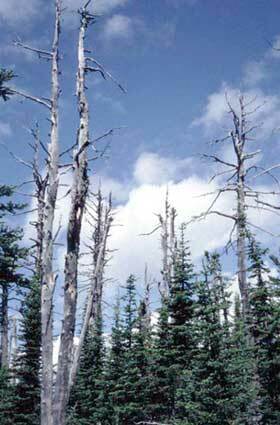 Other cold, dry sites (less than 53 inches of rain per year) may support extensive stands of lodgepole pine. Over time, cold forests that receive more than 35 inches of rain per year tend to become dominated by Englemann spruce and subalpine fir. The deciduous Alpine larch thrives in some of the highest and coldest sites within the maritime-influenced climatic zone of northern Idaho and western Montana. By shedding its needles, this larch can withstand severe winter weather better than any of the evergreen conifers. The understory of upper subalpine forests usually contains a mere handful of plant species. (Fischer and Bradley 1987). Woody plants may include grouse whortleberry, blue huckleberry, dwarf huckleberry, twinflower, kinnikinnick, white spirea, bunchberry, common snowberry, menziesia, yellow mountain heather, gooseberry current, common juniper, and Oregon-grape. Heartleaf arnica, broadleaf arnica, ballhead sandwort, slender hawkweed, and western meadow-rue are typical forbs. Grass and grasslike vegetation may include Idaho fescue, pinegrass, bluejoint reedgrass, beargrass, Parry rush, smooth woodrush, Ross' sedge, and elk sedge. The grasses and shrubs often develop in dense mats or layers. Areas of exposed rock and bare soil are common. 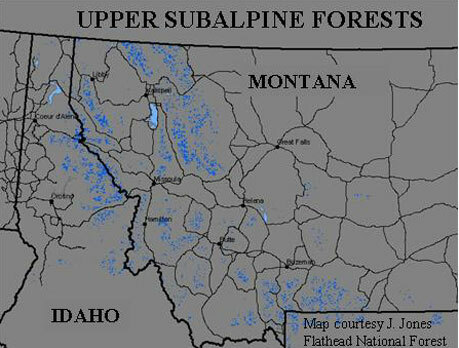 Forests of the upper subalpine type, mapped in blue above, constitute approximately 6% of the total forested acreage within our focal area. White pine blister rust, Cronartium ribicola, has killed many whitebark pines within the region. This fungus also infects, but does not usually kill, currants and gooseberries that grow in the understories of upper subalpine forests (Hoff 1992). 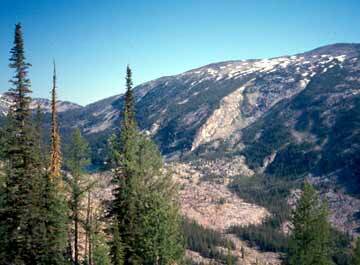 Upper subalpine forests found at timberline in western Montana and northern Idaho. Populations of whitebark pine are dwindling in western Montana due to the combined influences of blister rust infection, mountain pine beetle infestation, and subalpine fir encroachment (Keane and Arno 1993). Fischer, W. C., and A. F. Bradley. 1987. Fire Ecology of western Montana forest habitat types. USDA Forest Service, Intermountain Research Station, General Technical Report, INT-223. Hoff, R. J. 1992. How to recognize blister rust infection on whitebark pine. USDA Forest Service, Intermountain Research Station, Research Note, RN-INT-406. Available online at http://www.fs.fed.us/rm/pubs/int_rn406.pdf. Keane, R. E., and S. F. Arno. 1993. Rapid decline of whitebark pine in western Montana: evidence from 20-year remeasurements. Western Journal of Applied Forestry 8:44-47. Available online at http://www.bitterroot.com/grizzly/PINE%20DECLINE.HTML.